Olfaction theory has a long history of controversy. The vibration mechanism was first proposed by Dyson in 1938 to describe odorant molecule vibrations from 1500-3000 cm-1 followed by Wright in 1954 over the range 100-700 cm-1. Both vibration theories were based on the FIR region of the EM spectrum - the higher frequencies associated functional groups of the odorant molecule while the lower frequencies with the vibrations of the molecule as a whole. FIR stands for far infrared and EM for electromagnetic. 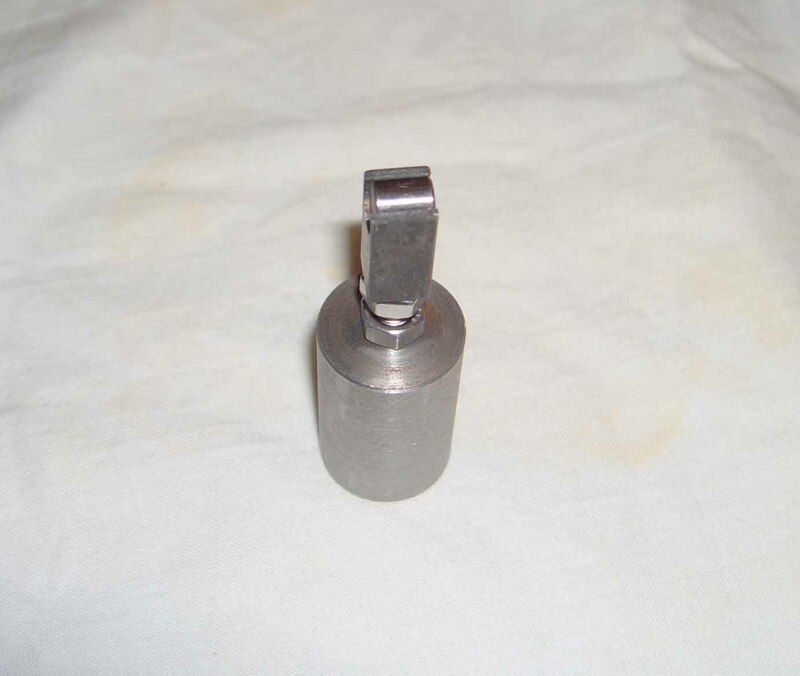 The shape mechanism formulated in 1949 based on Linus Pauling's lock and key mechanism superseded the vibration theories and today remains the mainstream theory. When Buck and Axel published their Nobel Prize winning research on the olfactory receptors in 1991, the G-protein receptors were used for olfaction. 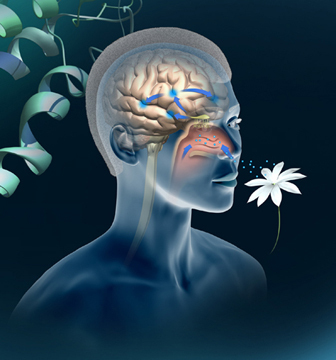 Since all types of G-protein receptors currently known are activated through binding of molecules with highly specific conformations, or shape, it was assumed that olfactory receptors operate in a similar fashion. Current work on shape theory focuses on neural processing, rather than the specific mechanism between odorant and receptor that generates the original signal However, Luca Turin revived the olfaction controversy by proposing the G-protein-coupled receptors in Pauling’s lock and key mechanism were actually measuring molecular vibrations  using phonon assisted inelastic electron tunneling. However, current olfaction mechanisms have a fundamental problem. Both lack a source of EM energy to signal the G-protein receptor that the odorant molecule is in the nose. For example, EM energy in the form of laser radiation could, if available excite the odorant molecule to emit its unique spectral content as the signal for G-protein recognition. By the Pauling’s shape mechanism, the odorant molecule must first fit in the receptors’ binding site. Turin’s vibration mechanism  not only must follow the shape mechanism in this regard, but electron tunneling is far more complex because electrons cannot travel through the odorant molecule unless a vibration energy mode is compatible with the difference in energies between two energy levels on the G-protein receptor. 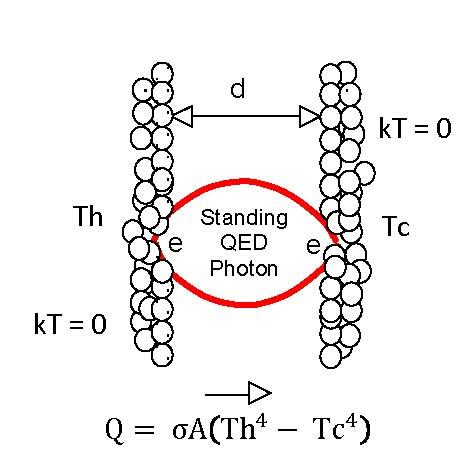 In contrast, the source of EM energy in QED induced radiation depends on the QM constraints on the thermal kT energy absorbed by the odorant molecule upon collision  with the nose surface. QED stands for quantum electrodynamics, k for Boltzmann’s constant, T for absolute temperature, and QM for quantum mechanics. Unlike classical statistical mechanics, QM precludes the odorant molecule upon leaving the nose surface from conserving the excess kT energy by an increase in temperature. Instead, conservation proceeds by QED inducing the conversion of the excess kT energy to non-thermal EM emission given by its unique IR spectrum from 0 to 3000 cm-1. Hence, QED induced radiation allows the odorant molecule to signal the G-protein receptors of its presence in the nose. 1. Brookes, J. et al., “Could Humans Recognize Odor by Phonon Assisted Tunneling?”, PRL, 98, 038101, 2007. 2. Prevenslik, T. See http://www.nanoqed.org at “Smell and the Nose”, 2010. Molecular Dynamics (MD) simulations of heat transfer based on classical statistical mechanics allow the atom to have thermal heat capacity through kT energy. Here k is Boltzmann’s constant and T absolute temperature. 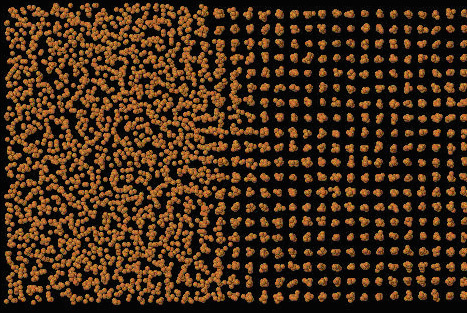 MD simulations of the bulk using submicron computational boxes with periodic boundary conditions are therefore valid representations of the bulk where the atoms do indeed have thermal kT energy. Specific heat by Debye’s phonons leading to unphysical conclusions of reduced thermal conductivity in thin films and violations of mixing rules in nanofluids may be avoided by treating the nanostructures having atoms emitting photons similar to the walls of an evacuated cavity as embodied in Planck’s derivation of the blackbody relation. Unlike Debye’s phonons having macroscopic specific heat at the nanoscale, specific heat by Planck’s photons vanishes, the consequence of which is that thin film conductivity remains at bulk as film thickness is reduced and nanofluids obey standard mixing rules. See this page at "Zero Specific Heat' and "QED Induced Heat Transfer", 2010. Specific heat in a crystal by photons finds basis in Planck’s derivation of blackbody radiation in an evacuated cavity except for the reduced speed of light in the crystal. Unlike Debye’s phonons, Planck’s photons are consistent with QM in that the inexhaustible energy source for atomic vibrations observed in FIR spectra is the thermal kT energy of the atom - the source of all EM radiation. QM stands for quantum mechanics, FIR for far infrared, k for Boltzmann’s constant, T for absolute temperature, and EM for electromagnetic. In the 1950’s, lack of experimental FIR data did not allow Raman to support his argument that the specific heat of a crystal is determined by averaging the specific heat for all FIR spectral lines using Einstein’s theory of characteristic vibrations. 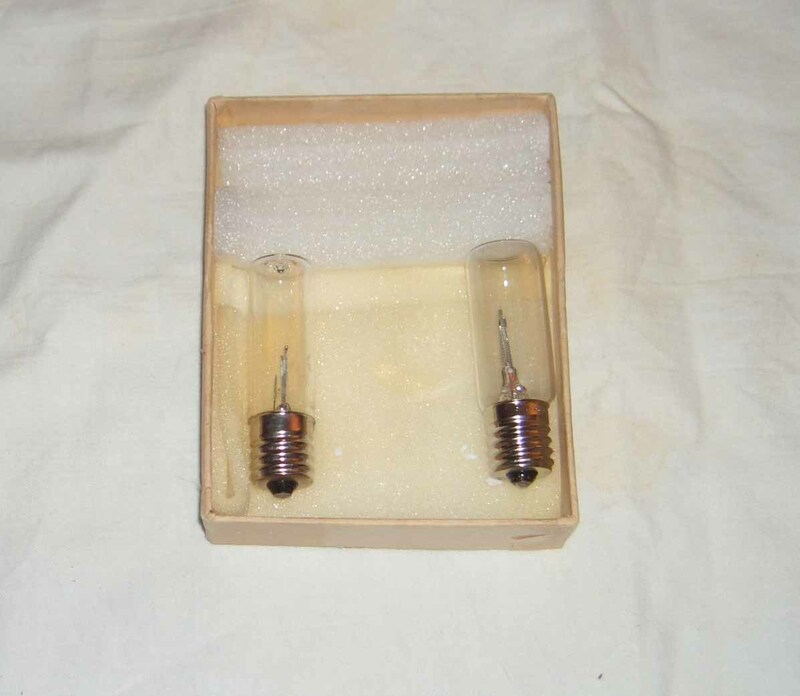 Experimental specific heats over the temperature range from 15 to 300 K were used to compute an effective average characteristic vibration frequency based on Einstein’s specific heat. For silver, aluminum, and lead, Raman’s average frequencies were 102, 163, and 35 cm-1. However, the average frequencies based on Planck's specific heat for silver, aluminum, and lead were found to be higher at 175, 222, and 333 cm-1, respectively. To explain this disparity, one must note that FIR spectra are not so simple to be represented by a number of discrete spectral lines. Typical FIR spectra show spectral lines superimposed on a broad background thereby holding in question Raman’s averaging the specific heats computed from discrete spectral lines. Lower average frequencies are expected in subsequent papers by including the average Planck specific heat of the broadband background by integrating the normalized absorbance over the range of appropriate wavelengths. 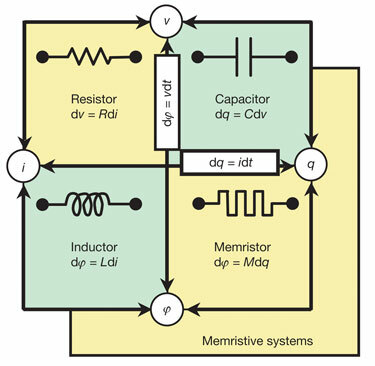 Memristors - The Fourth Element? Photochemical reactions differ by allowing the ZDDP pads to form by cross-linking of polyphosphate chains at relatively low temperature and pressure, but require a source of radiation. The proposed photochemical source is a consequence of QM where the pads are induced by QED to produce EM radiation at UV levels or beyond. QM stands for quantum mechanics, QED for quantum electrodynamics, EM for electromagnetic, and UV for ultraviolet. QM requires the submicron pads to have vanishing specific heat, and therefore frictional heat absorbed in rubbing cannot be conserved by an increase in temperature. Instead, conservation proceeds by creating QED photons at levels beyond the UV inside the ZDDP pads that in combination with zinc as a catalyst allow pad growth by the photochemical cross-linking of polyphosphate chains. Although the claim is made excitons in nanoscale systems depend on the physical dimensions of the nanostructure, and not by electron–hole Coulomb interaction, the confinement mechanism by which this occurs is not presented. Instead, confinement of carbon nanotubes (CNTs) and quantum dots (QDs) is described only by their characteristic dimension, i.e. their diameter and radius, respectively Ibid. Moreover, exciton energies at the macroscale are no higher than a few 100 meV, but are far higher at the nanoscale, Even so, the QD and CNT absorption spectra shows energies that extend far beyond the ultraviolet (UV). Exciton energies simply cannot explain the absorption spectra of CNTs and QDs. Of fundamental importance at the nanoscale is whether the mechanism of light-matter interaction is by the widely accepted notion that free excitons comprising pairs of electrons and holes created by direct photoexcitation by energetic photons OR by hypothetical exciton-polariton pairs resulting from the coupling of light with an exciton. See Press Release on Excitons at the Nanoscale. What is the source of the energetic photons in NWs? QED induced radiation is the proposed source of energetic photons that creates free excitons in NWs.. Indeed, NWs like quantum dots (QDs) and carbon nanotubes (CNTs) and other nanostructures show very high absortion beyond the ultraviolet (UV) allowing excitons to be created by photoexcitation. QED stands for quantum electrodynamics. QED radiation is the consequence of QM that requires the heat capacity of the nanostructure to vanish under the TIR confinement. QM stands for quantum mechanics and tir for total internal reflection.Unlike classical heat transfer that allows the atom to have thermal kT energy at the nanoscale, QM requires the heat capacity to vanish. Lacking heat capacity, absorbed energy cannot be conserved by an increase in temperature, and therefore conservation proceeds by the QED induced creation of photons inside the nanostructure. TIR confinement constrains the absorbed energy tangential to the surface the NW rather than volume because of the high surface to volume ratio. Typically, lasers are used to excite many in a transparent liquid, but QED radiation is induced any time energy of any form is absorbed at the nanoscale, including joule heating of individual NWs. See applications of QED radiation on this page, 2009-2011. A comparison of QED radiation and exciton-polariton theories in relation to ZnO nanowires is given in Press Release , the conclusions of which are as follows. 1. Light-matter interaction in NWs is by free excitons created by direct photoexcitation from highly energetic QED induced radiation. Hypothetical exciton-polaritons resulting from the coupling of light with an exciton need not be invoked. Indeed, light-matter interaction of photons in crystals is sufficient to explain NW luminescence. 1. Light-matter interaction in NWs is by free excitons created by direct photoexcitation from highly energetic QED induced radiation. Hypothetical exciton-polariton pairs resulting from the coupling of light with an exciton need not be invoked.Indeed, light-matter interactioon of photons in crystals is sufficient to explain NW luminesence. 2. QED radiation comprising high energy QED photons depending only on the size of NWs explains their significant absorption spectrum beyond the UV. Hypothetical polaritons may be dismissed as the source of absorption may be dismissed because excitons, like phonons can only respond at acoustic frequencies and not at optical frequencies on femtosecond time scales. 3. Unlike exciton-polaritons, QED radiation in NWs relies on the TIR confinement of absorbed energy to create QED photons inside the NW. However,TIR confinement of photons is only momentary upon the absorption of energy and vanishes as the energy leaks to the surroundings, or is no longer supplied, i.e., if the NWs do not absorb energy, there is no TIR confinement. 4. NWs of ZnO having a band gap of 3.26 eV and diameters of 200 nm lack radial confinement and allow a large fraction of QED photons to escape the NW body. By selecting the NW diameter less than 100 nm, QED photons at the ZnO band gap may be efficiently emitted at the NW ends. Unlike humans, insects evolved with a pair of antenna provided with sensilla disposed along their length. Olfaction in insects is thought to follow shape theory of smell in humans. However, like humans, olfaction is questionable because the probability of the pheromone finding the receptor on the sensilla with the perfect fit is extremely unlikely. 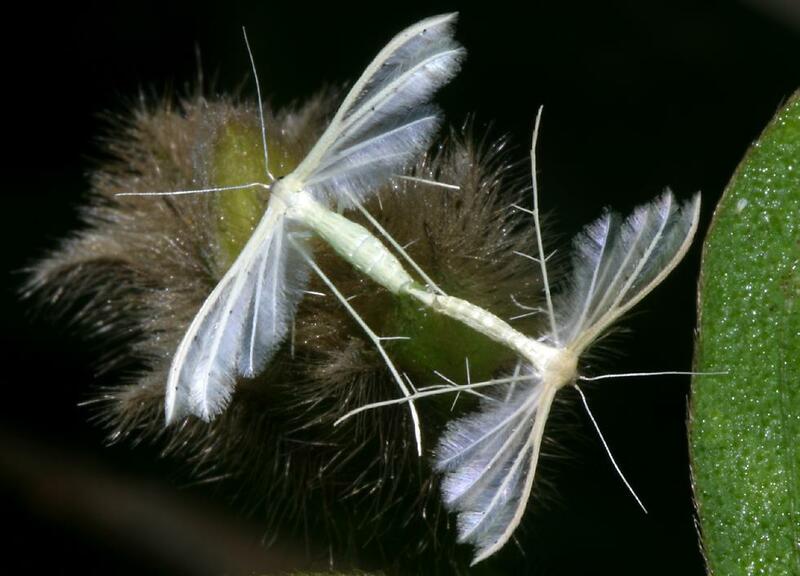 EM communication would greatly increase the probability of the pheromone finding the receptor and enhance mating. A similar problem exists in human olfaction in the recogniton of odors where it was proposed that the FIR spectrum of the odorant is emtted upon the odorant molecule contacting the inside nose surface, the mechanism called "Contact induced FIR Spectra." See above "Chemical Sensing by QED", 2011. 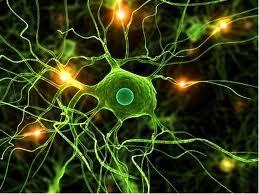 Mainstream theory of neuron signaling is based on chemical reactions at local contacts called synapses. Cells are electrically isolated from each other, the presynaptic cell separated from the postsynaptic cell by the synaptic cleft. A change in the electrical potential in the presynaptic cell triggers a release of neurotransmitters (NTs) into the cleft by exocytosis. The NTs comprise vesicles of small molecules or neuropeptides. But the NTs are submicron, and therefore may be considered nanoparticles (NPs). There is a problem with classical biology. The cleft is 20-50 nm wide, but the NPs are larger. NPs of small molecules have diameters of 40-60 nm while those of neuropeptides are 60-250 nms. What this means is the NPs must dissolve into their NT molecules before entering the cleft. 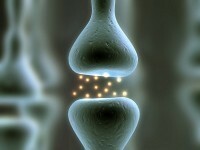 Dissolution takes time and the neuron signal is not transferred until the NT molecules bind to receptors on the postsynaptic cell. In contrast, QED induced synapse occurs solely from EM radiation produced at the instant NPs and their NT molecules become isolated even prior to entering the cleft. The NT molecules have thermal kT energy acquired in the presynaptic cell during endocytosis, but once momentarily isolated at the surface of the presynaptic cell by exocytosis are forbidden to have thermal energy by quantum mechanics (QM). Conservation proceeds by a burst of EM radiation corresponding to the unique EM spectra of the NT molecules. Similar QED radiation producing EM radiation beyond the UV by the fragmentation of epithelial cells that damage the DNA and possibly lead to cancer was recently proposed. See this page at "Cancer by Epithelial Tissue Disorganization" and "Nanoparticle Toxicity and Cancer", 2010. 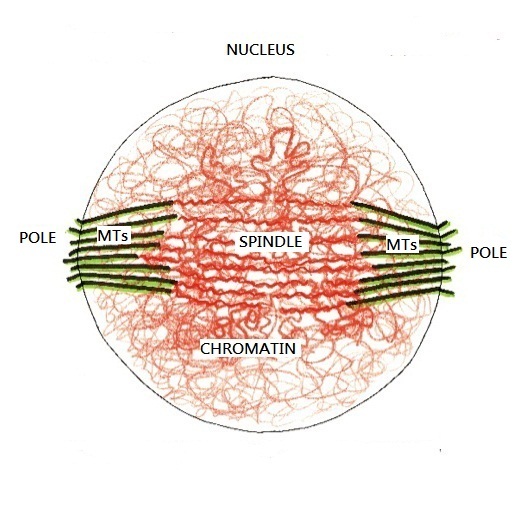 Spindles in cells assemble around tangled chromatin by self-organization of microtubules (MTs). In centrosomal spindles, MTs are thought catalyzed by centrosomes at the spindle poles. But his is questionable because anastral spindles having poles without centrosomes also assemble. In this paper, MTs in both chromosomal and anastral spindles are proposed to assemble by photolysis from the QED induced EM radiation emitted from the MTs themselves. QED stands for quantum electrodynamics and EM for electromagnetic. 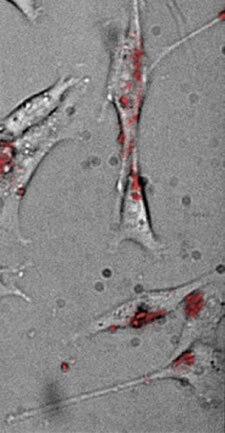 In the cell, MTs are straight fibers while the chromatin fibers are tangled as whown in the above figure. Otherwise both fibers have diameters of about 25 nm, and as such are subject to constraints of zero specific heat capacity imposed by quantum mechanics (QM). Hence, thermal energy absorbed by the fibers from collisions of water molecules cannot be conserved by an increase in temperature. Instead, conservation proceeds by the creation of QED induced photons inside the fibers under EM confinement by total internal reflection (TIR). TIR confinement is significant and creates energetic QED photons that provide polymerization dynamics with the energy to nucleate MTs on chromatin fibers and grow MTs from tubulin by photolysis. Conversely, QED induced photolysis assists MT disassembly upon binding of severing proteins. Growth and dissasembly comptete with each other to alter the MT lenghts. In 1822, the theory of thermal transport in solids began with Fourier’s transient heat conduction equation for temperatures in macroscopic systems. Quantum mechanics (QM) was introduced through the specific heat capacity in combination with phonons as heat carriers by Einstein and Debye in 1907 and 1912. Over the past decade, anomalous thermal response of microscopic systems prompted review of Fourier’s equation. Currently, density functional theory (DFT) combined with non-equilibrium Green's functions (NEGF) based on phonon interactions is being proposed to describe thermal transport in discrete microscopic systems. However, QM restricts the heat capacity of microscopic systems thereby questioning NEGF thermal transport by phonons as heat carriers. Electron transport by NEGF cannot be used as an analog for thermal transport because electron transport is not affected by heat capacity. In fact, it is unlikely thermal transport in microscopic systems even exists. Indeed, QM embodied in the Einstein-Hopf relation for the harmonic oscillator precludes any and all thermal transport in discrete microscopic systems based on their submicron size alone. A typical NEGF model of molecular wires is depicted above. NEGF claims the thermal conductivity to depend on the length of the molecule. In contrast, QED theory claims there is no conduction by phonons along the molecule, and instead the Joule heat is dissipated by the emission of QED photons to the surroundings. In 1929, Hubble formulated a law based on the Doppler shift that claimed all wavelengths of light from a galaxy were redshift by the same amount leading to the notion of Universe expansion. 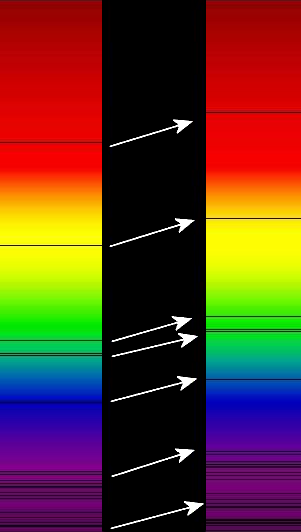 In the figure, the redshift wavelength Lo and emission wavelength L are shown on the right and left, respectively. The redshift Z = (Lo – L)/L may be rewritten as Lo-L = ZL. For the same Z, the difference (Lo – L) for L in the red is greater than in the blue. But the figure incorrectly shows (Lo-L) to be the same everywhere. You can check it out! What this means the redshift Lo depends on the emission L, and therefore a galaxy luminosity spectrum with more than 1 emission wavelength L will be redshift differently. Recently, Marmet in a comparison of redshift mechanisms described a number of theories based on photon interactions with electrons that like the Doppler shift also redshift Lyman alpha emissions without a change in wavelength. Vision under dark-adapted conditions is controlled by rhodopsin pigment molecules having an extremely high sensitivity to light. Thermal energy is thought to assist pigment activation under dark conditions, but is not quiet and produces noise. In this regard,a thermal mechanism was recently proposed to assist pigment photoisomerization. See Paper. Since the activation energy of rhodopsin is above that of dark rhodopsin, the amount of thermal energy necessary to assist pigment isomerization in the dark was estimated at about 1.2 eV. 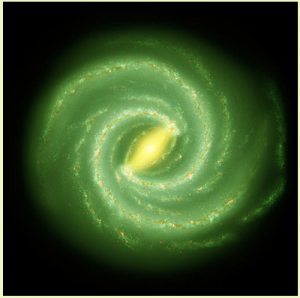 However, the Boltzmann distribution showed it is extremely unlikely that thermal energy of this magnitude can be accessed at ambient temperature. Because of this, Hinshelwood's statistical mechanics relation was adopted allowing each vibration mode in the pigment to contribute 1 unit of kT energy to the available thermal energy for pigment isomerization. At ambient temperature, kT ~ 0.0258 eV, and therefore it was concluded that about 45 vibration modes provided the necessary ~ 1.2 eV to assist pigment isomerization. However, statistical mechanics is only applicable to the collective properties of a large number of molecules. Individual pigment molecules in non-bonded contact with rhodopsin receptors do not follow the rules of statistical mechanics. What this means is Hinshelwood's derivation allowing each vibration mode in the pigment molecule to contribute a unit of kT energy to the pigment is of questionable validity. Unlike statistical mechanics, quantum mechanics allows the individual pigment molecule to access thermal energy upon intermittent contact with the rhodopsin receptors in the retinal membrane. See Press Release Contact occurs repeatedly as the pigment molecule vibrates against the rhodopsin receptor. Since the rhodopsin is integral with the macroscopic membrane, the rhodopsin provides a source of kT energy at body temperature for thermally activating pigment isomerization. Each time the pigment contacts the receptor it momentarily becomes a part of a macroscopic body and spontaneously acquires thermal kT energy. Upon loss of contact, however, the pigment molecule is free while still having the thermal kT energy acquired during contact. But in the free state, the acquired kT energy cannot be conserved by an increase in temperature because the pigment like any nanostructure is precluded by QM from having heat capacity. Conservation may only proceed by QED inducing the pigment molecule to emit the acquired kT energy as non-thermal radiation given by its EM spectrum, the VIS content of which randomly activating the pigment. Electrical charge in nanoelectronic circuit elements – resistors, capacitors, and inductors - is explained by the quantum mechanics requirement that heat capacity vanishes in nanostructures. In the memristor, Joule heating therefore cannot be conserved by an increase in temperature. Instead, conservation proceeds by the QED induced creation of photons within the TIR confinement frequency of the memristor. QED stands for quantum electrodynamics and TIR for total internal reflection. The TIR confinement of QED photons is enhanced by the fact the absorbed energy is concentrated in the TIR mode because of the high surface to volume ratio in nanostructures. The QED photons having Planck energy beyond the ultraviolet produce excitons, the electrons and holes of which reduce the resistance of the memristor, but the resistance is recovered later in the same cycle as the electrons and holes are attracted to and destroyed by the polarity of the voltage terminals. Earlier work on the HP memristors is described above on this page in “Memristors – the Fourth Element”. Revisions for the ICIC 2011 Conference are given in Paper and Presentation. The latest HP simulations are given in Paper that includes comments on QED heat transfer in nanowire memristors, the Ovshinsky Effect, phase-change random access memory –PCRAM, and ballistic transport in nanocontacts. Nanocars are described to illustrate the generality of QED radiation. In 1968, Ovshinsky initiated scientific research in the field of amorphous and disordered materials that continues to this day. 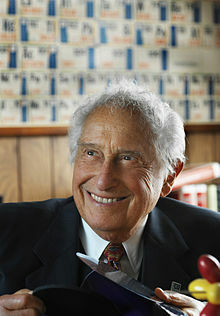 For a history of Ovshinsky's contributions to American science, see Ovshinsky The photograph of Ovshinsky above was taken in 2005. 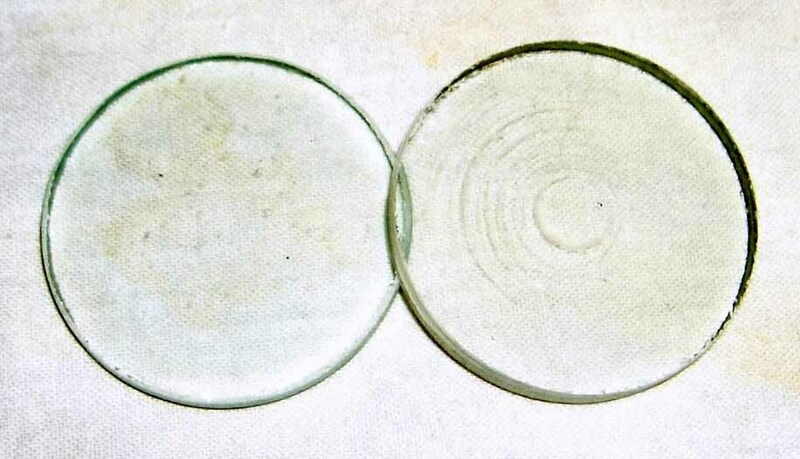 The Ovshinsky Effect occurs when the resistance of thin GST films called chalcogenides is significantly reduced upon the application of low voltage. This is of fundamental importance in phase-change random-access memory (PC-RAM) devices, the most familiar of which being the rewritable CD-RW disks. 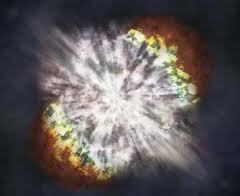 However, the Ovshinsky Effect is not without controversy. In 1968, Ovshinsky thought the resistance of GST films is reduced by the redistribution of charge carriers; whereas, others at that time including many PC-RAM researchers today argue that the GST resistance changes because the GST amorphous state is physically changed to the crystalline state by melting from heat supplied by external heaters. In this controversy, quantum mechanics (QM) asserts that provided the GST films are submicron the heat capacity vanishes, and therefore the heat supplied cannot be conserved by an increase in GST film temperature. What this means is switching from the high to low resistance GST states is not caused by melting from the amorphous to crystalline states. By precluding melting, QM has re-opened the controversy between the melting and charge carrier mechanisms that underly the Ovshinsky Effect. Scientists have recently reported the measurement of temperatures inside mouse cells using nano-thermometers, better called QD thermometers. QD stands for quantum dot. 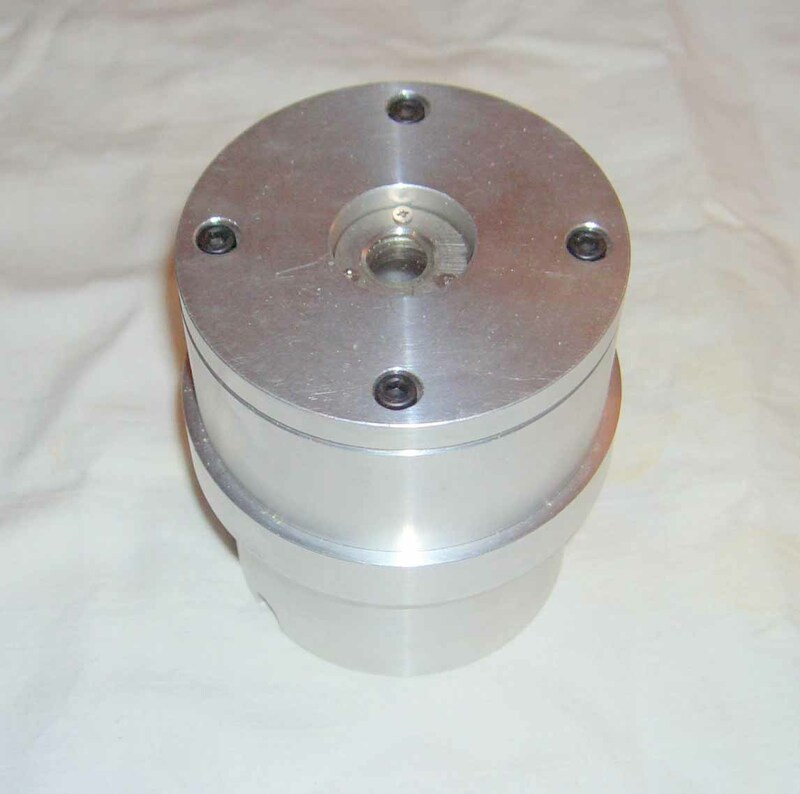 The QDs are sub-micron nanoparticles of semiconductor materials that are small enough to enter individual cells. 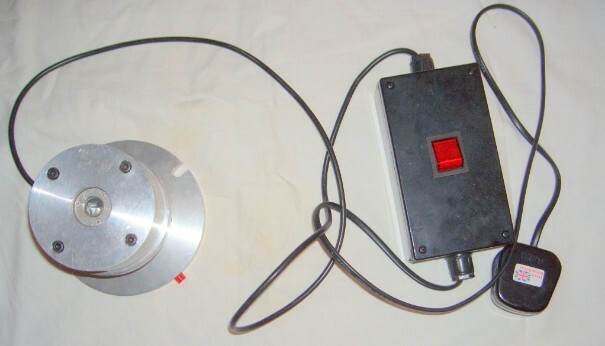 The QDs are thought to increase in temperature by absorbing laser light, the temperatures of which are inferred from the phosphorescent QD emission. However, QM requires the heat capacity of submicron QDs to vanish, and therefore any metabolic heat or laser excitation absorbed by the QD cannot be conserved by an increase in temperature. What this means is QD photon emission or Raman shift by phonon confinement may have nothing to do with the cell temperature. A clarification of what the QDs are actually measuring is required. By the theory of QED induced radiation, the observed VIS fluorescence and IR Raman shifts are a consequence of absorbed EM energy by metabolic heat or light from laser excitation..Instead of increasing temperature, conservation proceeds by the frequency up-conversion of the absorbed EM energy to the TIR confinement frequency of the QD. 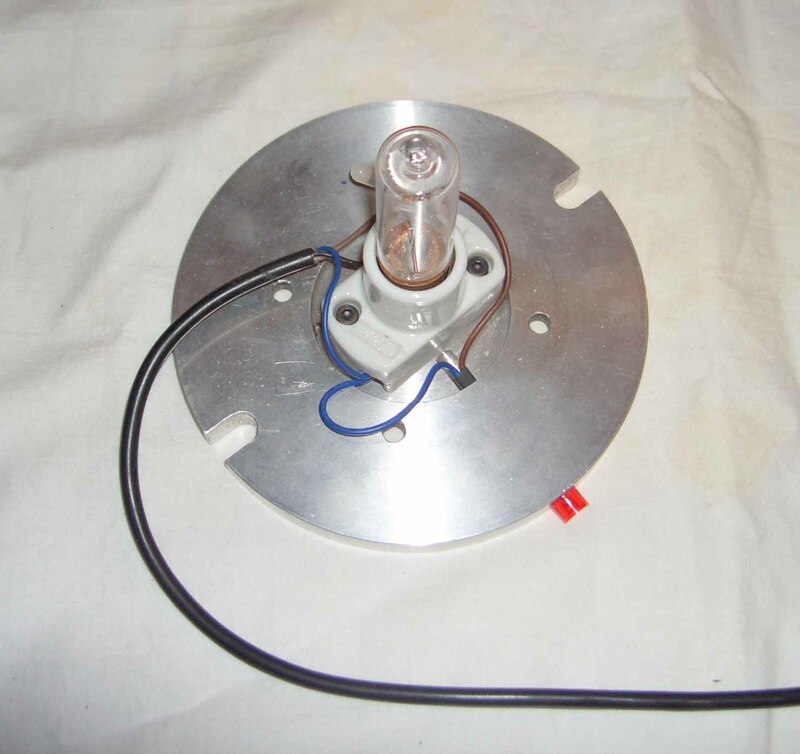 TIR is enhanced by the fact QDs having a high surface to volume ratio concentrate the absorbed heat or light in their surface thereby providing the confinement necessary to create high-energy QED photons within the QD. Subsequently, the QED photons as an EM source excite the VIS fluorescence and Raman shifts. All this occurs without an increase in QD temperature. Temperatures measured from the QD spectra by exciting the QDs not in contact with the cell with NIR light have nothing to do with the temperature of the QD thermometer itself, as QM precludes any temperature response to absorption of NIR light. However, the QDs in contact with the cell become part of a macroscopic thermal sink that maintain the QD at cell temperature even under laser excitation. "I remember thinking, I've made a terrible mistake and I have to find this mistake." The 2011 Tribochemistry Conference was held at Hagi in western Japan. See the Technical Program. QED Radiation made both and oral and poster presentation. The oral was entitled "The validity of Heat Transfer by Molecular Dynamics".and the poster title was"Engine lubrication by UV Radiation." Comments to the PPT Presentation questioned the applicability of QM to MD simulations. The response to these comments are given in Press Release. Historically, Planck’s theory of BB radiation stands as one of the greatest achievements of all time in that the dispersion of the EM emission of photons with wavelength (or frequency) was shown to depend solely on the temperature of the material surface. BB stands for blackbody and EM for electromagnetic. More fundamentally, Planck’s theory also provided the basis for quantum mechanics (QM). At the macroscale, Planck’s theory has served well in predicting radiative heat transfer provided the gap or separation between heat transfer surfaces is large compared to the wavelength of the emitted thermal radiation. However, Planck never claimed his theory was applicable to the radiative heat transfer across nanoscale gaps even though high frequency photons standing across the gap are far more efficient than those for long wavelength radiation at the macroscale. In this regard, photons standing across the gap transfer heat promptly at the speed of light, and therefore Planck most likely did not include heat transfer by evanescent phonon waves moving at acoustic velocity in his theory because phonons are too slow to be of any consequence in conserving radiative heat transfer. Claims that the Planck theory of blackbody radiation imposes a limit on the maximum radiative heat transfer between surfaces can be safely dismissed because Planck never imposed any such limit. Nevertheless, experimental data for nanoscale gaps between flat plates unambiguously show near–field enhancement of heat transfer above that given by Planck theory. In fact, the data is consistent with the QM enhancement of the near-field by standing wave photons in the theory of QED radiation. QED stands for quantum electrodynamics. Although nanoscale heat transfer is promptly conserved by standing QED photons, the tunneling of EM surface phonon polaritons between surfaces is the current theory of near-field enhancement. 1. QED induced heat transfer provides a simple theory for near-field enhancement perfectly consistent with Planck’s QM and theory of BB radiation. Classical electromagnetics theory based on tunneling of evanescent waves by phonon surface polaritons or photons that differ conceptually from the QM inherent in Planck’s theory cannot be expected to explain near-field enhancement. 2. Near-field heat transfer by evanescent waves shows the heat flux varies inversely with d squared, and therefore as d vanishes, the heat flux diverges. With evanescent waves, divergence occurs because the heat transfer depends on whether the media is lossy or nonlossy, a condition that is not readily known thereby questioning the applicability of any evanescent theory. 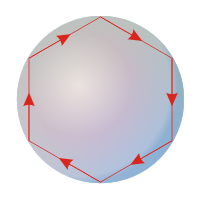 In contrast, Qqed also gives an inverse d squared dependence, but differs in that there is no divergence because the standing QED photons penetrate distance e below the surface, i.e., Qqed converges to h(c/2e)^2 as d vanishes upon surface contact. 3. Conservation of radiative heat transfer by QED photons in nanoscale gaps is prompt making the far slower evanescent waves by phonons inconsequential to near-field heat transfer. 4. The source of QED photons in the gap finds basis in the QM requirement that the kT energy of the atoms under EM confinement in surfaces at ambient temperature vanishes at (d+2e) < 3 microns. Lacking kT energy, the atoms cannot increase in temperature, and therefore the heat given by the S-B equation can only be conserved by the EM emission into the gap that by QED is induced to create QED photons. For the same hot and cold temperatures removed from the gap, the QED heat flow therefore is enhanced above that of Planck theory. Earlier work on Memristors given above on this page at "Memristors - the Fourth Element?" was extended to ICMON 2011 held in Venice, 29 November, 2011. See Paper and Presentation. Also, Phase Change Random Access Memory (PCRAM) given above at "The Ovshinsky Effect by Quantum Mechanics" was published at ICMON. See References  and . Comparisons of QED radiation emitted from nanoparticles by quantum mechanics with classical theory  given by Maxwell's equations show significant differences. Further review is suggested on the applicability of Maxwell's equations at the nanoscale. K.Tavzarashvili and G. Ghvedashvili, "Mas Simuations of Optical Antenna Structures," ICMON 2011.